Theo did his homework and appeared as a panelist on the first episode of the new series of BBC1's Question Time on Thursday September 13th. 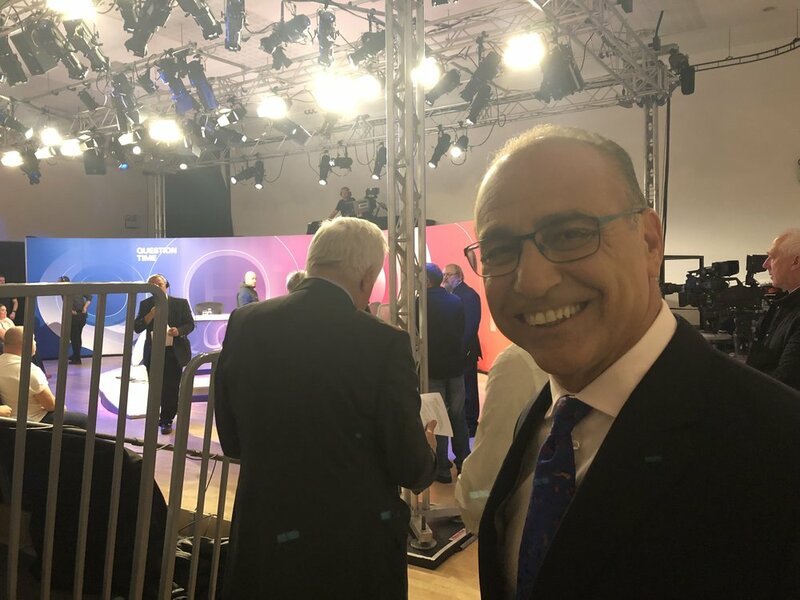 Presented by news veteran, David Dimbleby, in his last series as host, Theo was joined by a panel that spanned politics and news. Conservative Prisons Minister Rory Stewart MP, Labour MP Chris Leslie, Faiza Shaheen from Labour think tank CLASS and radio and political journalist Julia Hartley-Brewer all fielded questions from the audience, alongside Theo, over the fast-paced hour. Key topics included Russia, Brexit, if we should have a second Referendum, The Archbishop of Canterbury's recent speech, whether we have lost control of our prisons and Serena Williams' recent court outburst. During the evening, Theo commented on how politicians have negotiated Brexit so far in his eyes:"We didn't vote for the Tory Party to drive the bus into every other car on the road, crash it on the way, put it over the edge of a cliff..."
This episode of Question Time was filmed in Banbury, Oxfordshire.